Now before you all freak out - Miss M only goes to Child Care one, sometimes two days a week. Child Care wasn't part of our original plan two years ago when I returned to work, but due to sad family circumstances, it became a reality... Miss M attended a great centre right near my school for 18 months (which I should mention is about a half an hour drive from home). But this year we made the tough decision to move her to a centre closer to home so that Little Man wasn't spending up to two hours in the car per day (all the while trying to get him into a sleep routine). We are really happy with our decision and her regular attendance at Child Care this year has been really beneficial for every member of our family. Previously, I've described Miss M as a clingy koala, and she is still very much like this. Although, after 18 months of child care, and now at a new centre - she finally doesn't cry any more when I drop her off! Success!! I thought we'd never get there. Anyway, when I take her to an activity such as story time at the library, she is reluctant to sit with the group of children and join in with the songs. But at Child Care (so I'm told - I wish I could be a fly on the wall) - she goes along with the others. And it's super cute when she comes home reciting the songs and games they do and "plays child care". I also find (as you may have read here) - that she's not the best at sharing or interacting with other children on our play dates, but at Child Care - she has no trouble at all! Hands up if you know the power of a 'threenager'. It's diabolical at times! All those great big opinions and emotions with no where to escape except a voice at full volume or a flood of tears. Child Care is like hitting the reset button and she comes back glad to be home in her comfort zone. She often comes home eager to independently play with her own toys (especially if I've put out a few things for her she may not have played with for a while). She also returns home pretty tired, and always has a good night's sleep after her busy day. This is probably the most important for me. On the days when it's just me and both kids, I feel like I spend most of the day either feeding or settling the Little Man, and just popping him on his play mat hoping he doesn't cry for five minutes while I madly put washing on or make Miss M lunch. There have been times when I've finally gotten him to sleep and get out painting or home made play dough to do with Miss M - and five minutes later, he's awake again. But when it's just me and him, we get to play and bond with each other, and our day can revolve around him. ... and when he DOES sleep I finally get a break! Hello blog! 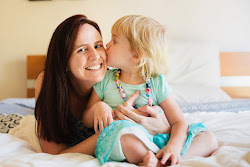 This is when we get reacquainted (if you're a regular follower of Teacher Types you may think that I blog all the time during the week, but truthfully, I do a lot on Miss M's Child Care days and just have draft posts ready to publish throughout the week). If I'm lucky and Little Man actually sleeps soundly in his pram - I feel like I'm shopping on my own. Luxury! I can take my time, think about my purchases, try things on, wander the shops and be sure to get everything on my list. Now this doesn't happen every time, but it's sure is easier than with two of them! A day of Miss M at Child Care is giving me the chance to 'breathe and reboot'. I have more effort and energy to play with Miss M and give her the attention she needs. My patience is no longer worn thin and I feel like we are back on track. They say that parenting is one of the hardest jobs in the world, and I personally believe that we deserve a break from time to time. I let go of the mummy guilt and told myself that I deserve it. I think this is one of those many personal parenting decisions that we all make along the way. And everyone's circumstances are different (money, family support, access to child care, personal beliefs, and if the older child was already in care before baby number 2 came along)... Thanks for respecting our decision to do what's best for our family. I'd love to hear your thoughts and stories. My kids both went to daycare at a very tiny age (3 months and 6 months). Then they got to experience me as a stay at home mum as well. They had the best of both worlds! I agree that daycare allowed my kids to have social skills. 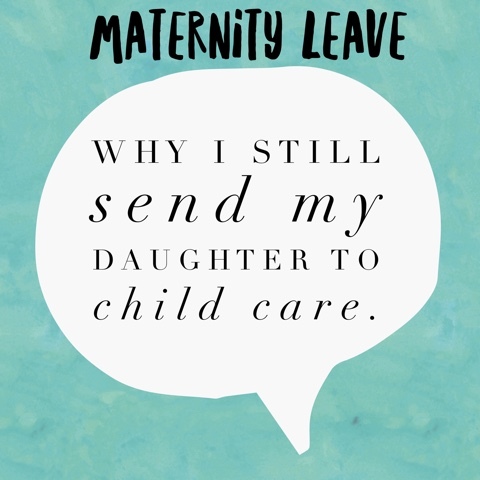 I wouldn't even be thinking of explaining your decision - child care is a life saver for me and always has been. I need my alone time to recharge and when I have both kids home with me for several days in a row, tempers get frayed! And you're right, sometimes sending my daughter to daycare and keeping my little son home is so lovely - I do miss all the one on one time with him that I had with her. Poor second kids always miss out! You describe it well when you say it gives you the chance to 'recharge'. One on one time is so important for BOTH children isn't it? We chose for me to be home with our kids when they were small. It's something I'd always longed for, and back then I didn't have a job I was desperate to go back to. Typing stuff and answering phones just ain't that interesting. But what resonated with my introverted self was the personal space you've built into your week. As a mother of adults/teens who now works full time again.....ohhhhh the personal space. That's the thing I crave the most. If it works for you then kudos! I had an entire hour at home alone yesterday and it was f&*king glorious. It certainly makes you appreciate the alone time Vanessa. All of those reasons are exactly why my eldest continued to go to childcare when I was on maternity leave with my second. The most important for me was getting to spend quality time with number two. The first child is so lucky to get all of our attention in their early life, and the second and subsequent children can't. So having that one day a week where I could focus on number two and just enjoy her, without worrying about what Punky was up to or how she would feel with me paying attention to the baby was a relief. At the same time, it also made me more aware of making time just for Punky so she didn't feel like I was abandoning her or that I was always distracted. This is why I'm looking forward to her preschool holidays starting, as we'll get two full days when it's just us, like the old days, because her little sister will still be at childcare on those days. Definitely respect and support your decision and if I did end up having a second child, I believe I'd do the same. While Miss L is still not particularly enthused about having to go to day care, I feel like the change in environment, the routine and structure and the social interaction is really important. Also, after the first year when she basically had a runny nose from March to November, she has hardly even had a sniffle (touch wood) and that has to be a benefit! So true about the runny nose! I'll have to prepare for Little Man to get that next year when he starts! My son went to childcare two days a week at a centre within walking distance from our house so when our twins were born I would pop all three in the pram and walk him there and then take the girls for a walk for about 2hrs really and then get home in time to feed them again. In the afternoons I would usually pick him up in the car (because I am incredibly lazy!) But I didn't once feel guilty about him going there two days a week. It was the only time that I had with the girls and I never had one on one time with them. How lovely to be able to walk there! Miss M's dad has taken her there on the bike before, and a dog walk. She was pretty tired though! Sounds like with baby twins you absolutely made the right decision sending your son. I've been at home full time with my 2yr old since she was born but I'm definitely considering a day a week of childcare if we have another. I think I'll need the break and boy would it be nice to have free time during naps again. I've missed that so much.